Supply Chain Management (SCM) and Building Information Modelling (BIM) are seen as innovations that can manage complexities in construction by focusing on integrating processes and products respectively. Whereas these two innovations have been considered compatible, their practical combination has been mainly anecdotal. The Netherlands was the locale of this study, where both SCM and BIM have been popular approaches. 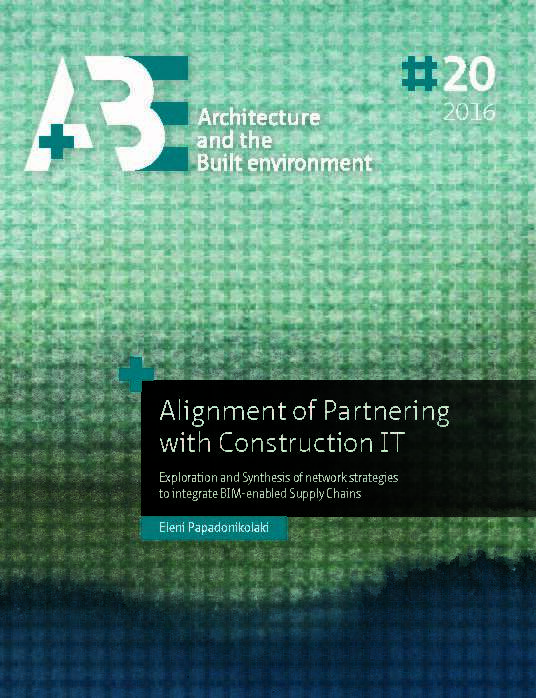 The research objective is to explore their real-world combination and propose strategies for the alignment of SCM and BIM, by viewing Supply Chain (SC) partnering as the inter-organisational proxy of SCM. The main question is: “How to align the SCM philosophy with BIM technologies to achieve integration in the construction industry? What aspects contribute to this alignment?”. The methodology was mixed and both qualitative and quantitative data were analysed. The overarching method was case study research and the unit of analysis was the firm, also referred to as ‘actor’. After a semi-chronological review of the relevant literature, the two constructs of SCM and BIM were found interdependent in product-, process-, and actor-related (P/P/A) dimensions. The study consisted of four other consecutive studies. First, empirical insights into the practical implementation of SC partnering and BIM were obtained via the exploration of five cases. Second, a conceptual model for the quantitative analysis of the product-, process-, and actor-related dimensions was designed. Third, this model and mixed methods were applied to two polar (extreme) cases to analyse the contractual (typically SC-related), digital (typically BIM-related), and informal interactions among the involved actors. Fourth, an additional theoretical exploration of the BIM-enabled SC partnerships took place with focusing also on intra-organisational relations within the involved firms. After the four studies, the findings were systematically combined to create the theoretical synthesis, i.e. generate theory. Three consecutive steps of ‘construct’, ‘internal’, and ‘external’ validity took place after the synthesis, to define the transferability of findings. The systematic combination of findings deduced two routes to achieve SC integration in construction: (a) product-related (emphasis on BIM tools), and (b) actor-related (emphasis on SCM philosophy). As the construction industry evolves into an information-driven sector, the alignment of construction IT with inter-organisational management is preeminent for managing the inherent complexities of the industry. In parallel, embracing inter-organisational approaches for information management such as BIM is a promisingway forward for SCM and construction management.